Elaine Hancock (Olney, United States) on 13 September 2017 in Plant & Nature. I would not want to sit on that! Close up of the Naranjilla leaves. Aïe ça pique ! Très originale cette plante. Ces fines épines sur les fueilles quelle compo quelle finesse sueprbe. Haaaaa oui !! Attention ! Me neither !! Ouch ! I think I would keep a good distance from this plant Elaine. Great shot. 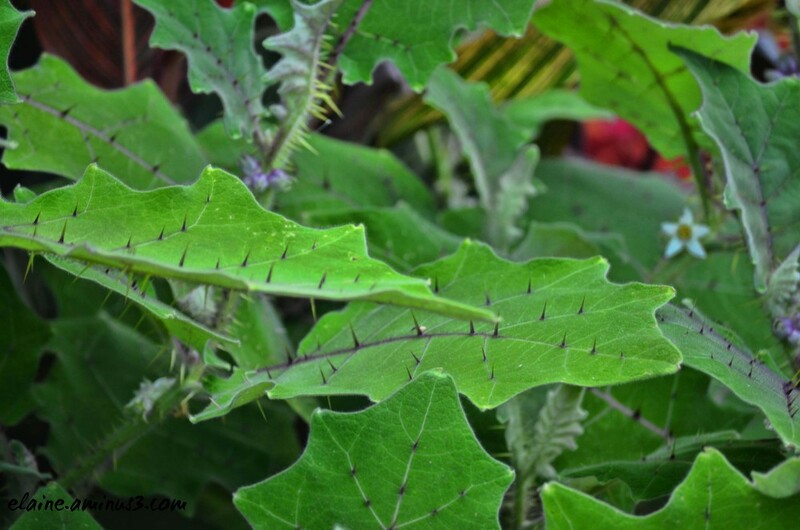 The Naranjilla leaves have been sharp points to avoid. A fine close up. Ouch ! this plant seems to be unkind. !! AMazing detail in this. Those look pretty painful! Ha ha, these leaves have a little too much character it seems. It's great to see this closer view. Great defense system, interesting leaves, not seen before. Quite right, I'd be ten yards back. Sorry for my recent absences from Aminus3, I only have another 50 frames to process then I will be done for a while. Wow!! Amazing how something so delicate, like this foliage, can grow thorns!! Excellent close-up! Oups...Superb capture ! Thank you very much for your visits and comments during my absence .